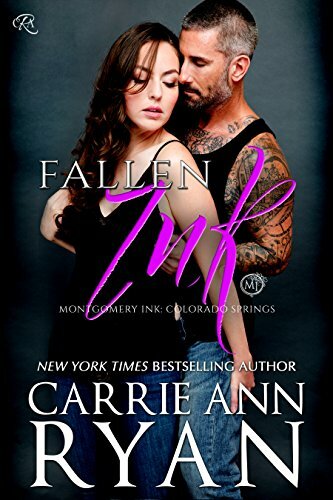 My favorite family of Inked and bearded men are back, this time though it’s a different branch of the Montgomery family tree, Carrie Ann Ryan gives us Montgomery Ink: Colorado Springs!!!! Ryan us blessed the world with the Montgomery cousins and I am one happy camper!!! On this branch of the family tree we have Adrienne, Shephard, Thea, and Roxie. Shep has already had his story told in Ink Inspired which was the start of the whole obsession that is Montgomery Ink. Now it’s Adrienne’s turn and the start of Colorado Springs. Maya and Austin, from the Denver Montgomery’s, are spreading their tattooed wings and opening a second tattoo studio called Montgomery Ink Too or MIT. Adrienne and Shep are part owners of it with their family as well as the managers. Adrienne is a tattoo artist and along with her bestie Mace, her brother, and friends they have MIT’s grand opening but it’s interrupted by some stranger saying that they aren’t welcome and that they wouldn’t be there long. Mace Knight is Adrienne’s best friend, a tattoo artist, and a weekend dad to his daughter. He is also a hot bearded silver fox!!!!! Out of the blue his ex leaves the country and leaving him a full time father to the daughter he loves, so having to learn to become a full time father as well as starting a new job is hard on him. Not only does Mace have a hard time with his new life, Adrienne is having a hard time also dealing with the new business and the threats to it. Adrienne and Mace lean more on each other than they already do and start something new along the way. I adore when best friends fall in love!! They already know everything about each other but also learn so much more. Adrienne and Mace are so good together I can’t believe that they haven’t moved beyond friends before now!!! The steam coming off these two can be seen for miles, but there is also tenderness. The tenderness between Mace and his daughter, between Adrienne and his daughter, and the way that he realizes that they make a perfect family. Between Adrienne and Mace falling in love and the threat to the business we learn about the other Montgomery girls and get to see how Shep and his family are doing now that he has moved back home to Colorado Springs. I can not wait to read more about this branch of the family.